“We have not, at this point, been able to determine the authenticity of that video. So that is something that’s currently being reviewed by the intel community and by the State Department,” White House press secretary Josh Earnest told Al Arabiya’s Nadia Bilbassy in Washington. “Since that video has not been authenticated, I’m not in a position to comment on it at this point.” Earnest added. State Department spokeswoman Jen Psaki later said in a press briefing that the United States has “no reason to doubt” the authenticity of Baghdadi’s video. “We have seen, of course, the reports of the video. We have no reason to doubt the authenticity of the video,” Psaki said. ISIS published on Saturday the video that purports to show Baghdadi, who declared himself recently as the “caliph” of all Muslims around the world. The hitherto elusive Baghdadi made his appeal in a sermon delivered on Friday in the militant-held northern Iraqi city of Mosul. “I am the wali (leader) who presides over you, though I am not the best of you, so if you see that I am right, assist me,” he said, wearing a black turban and robe. The video was released on at least two websites known to be used by the group. It bore the logo of al-Furqan, the group’s media arm. 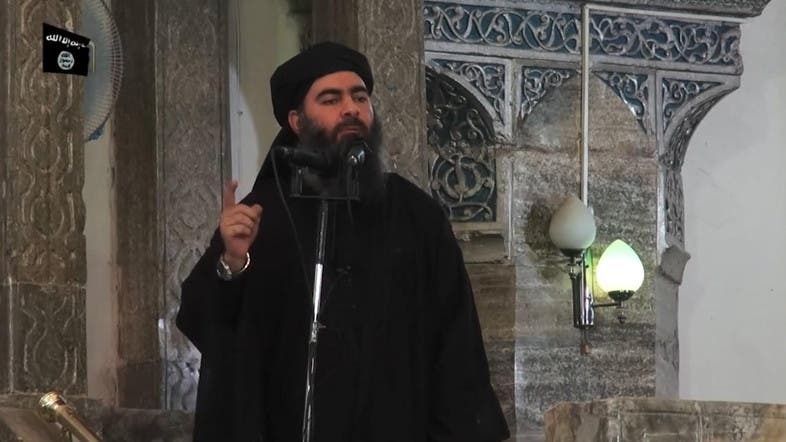 The video is the first ever official appearance by Baghdadi. He was dressed in black robes and a black turban, has dark eyes, thick eyebrows and a full black beard. He speaks eloquent classical Arabic, but with little emotion.